So knowing this, what kind of activities could you set up? Pull Toy: As the child is now walking freely, You could provide items that can be pulled along while walking. There are plenty commercial options available. Pictured below are two. You could also just tie a rope to a toy car or any item the child already has that has wheels. My son enjoys pulling these while crawling and as he is now walking , he pulls it while taking a few steps. These serve a different role from the walker wagon as they do not support the child. Instead they force him to practice walking without the support of his hands. I like the cricket better because it’s quiet and so beautifully made. We rotate them. Tracker/Ball and Tube: All gross motor movements require a strong core. A ball tracker is great for building strength as it requires the child to put the ball in, bend and retrieve the ball and then stand up again. If you don’t have a tracker, a ball and a tube attached to a wall works similarly. I made the example below using a plastic water bottle. I cut off the top and bottom and used some tape over the edge just incase they were sharp.You could use the cardboard tube from paper towels, or a tennis ball case to do this. I prefer a transparent tube because it allows the child to track the ball with his eyes and so he would be working his gross motor, fine motor, eye hand coordinations and visual tracking. I like having a shallow container to pick the balls from and a deep container to catch the ball. As the child grows older, you could set up multiple tubes so that the ball travels a maze. Open and close: If you spend some time observing your child over the course of the day, you will probably observe them trying to open or close objects. Children LOVE this activity and it is an easy one to put together. Choose items that fit in their hands and have different kinds of closures so it could be tupperware that requires the thumb to push the lid open, a small coin purse with a zipper, an old perfume sample bottle, hotel shampoo with a twist cap, an old ring box, cufflink boxes, spice containers, an altoids container, lip balm or lip gloss containers etc. You get the idea. I would limit it to 5 items and rotate as needed. 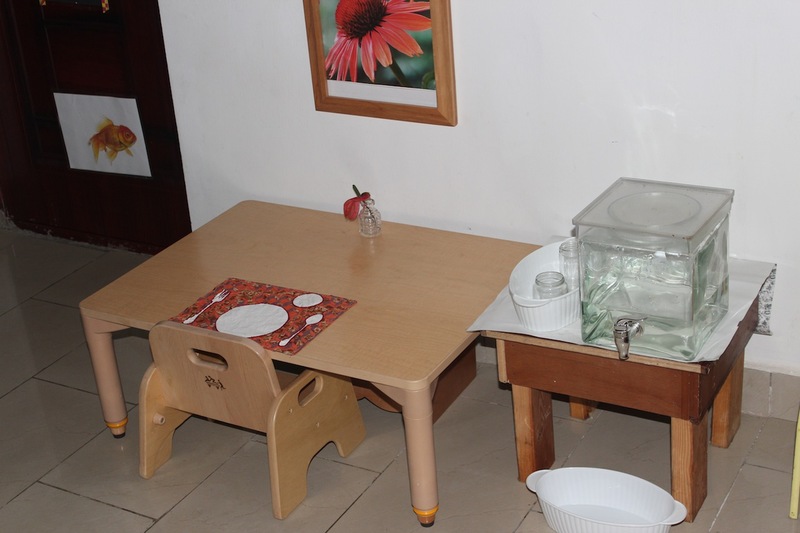 The different shapes of the containers and the different closers allow the child to use his hands in different ways. ring box, bag that held bra straps, wrapped old curry container and hotel shampoo bottle. The last two smell like their former contents even though I washed them. I demonstrated smelling the container after opening. He really like the bottle. Bead threading: As the name implies, this is simply passing a thread through beads. This requires concentration and fine motor skills. It lets the child use his pincer and improve his eye hand coordination. Note that to start with, I will limit the number of beads to about five. We always want the child to experience the accomplishment of finishing an activity. As he gets better, you can increase the number of beads and also use beads with smaller holes. I have used a shoe lace in the picture. you could also use a ribbon, just taper the end with cello tape. I also knotted one end so that the bead doesn’t fall off. Make sure the lace is not too long, I would say no longer than the child’s arm. Shaker and sticks: Another easy one to put together. This requires and old spice jar and some sticks. In my example I have used lollipop sticks. I also chose a spice jar with big holes. Once the child masters this and requires more of a challenge, I can use a jar/shaker with smaller holes and smaller sticks. Maybe tooth picks or broom sticks cut up. This works the pincer, two hands working together (one holding the shaker and the other putting in the sticks) and eye hand coordination. My son cannot open the shaker I have used, but he figured out how to shake out all the sticks. For an older child, I might provide a shaker that he can open by himself. This allows him to repeat the activity as many times as he wants. Also, in the beginning, after showing him how to do the activity, I had to sit and give him one stick at a time or he would get distracted with playing with the sticks. After a few times, he now picks the sticks by himself (most of the time). Like the beads, I limited the sticks (to 8). Water to drink: water is a basic human need and a frequent need too. Children in this age group may not be able to talk yet but there are several ways in which you could facilitate their independence and help them meet their need for water. First would be to teach them the sign for water. You can google it. We have been using this since my son started taking water at 6 months and it was the first sign he started making about a month later. You could also set up water somewhere that he can get it. There are several ways to do this depending on your comfort level. You could put a water bottle on his table so that he can take it whenever he wants. You could also put a bottle that requires adult assistance. He can bring the bottle to the adult when thirsty. Note that we are not using this set up yet but will once he is stable on his feet. It may be at a different location though. I just set this up to give you an idea. Another option is to set up a small water dispenser and show him how to work it. The tap on this dispenser works by pushing down the handle so it is very easy for a toddler to operate. The bowl at the bottom is to catch the water but keep in mind there will probably still be spills so you should probably show the child how to mop, and make a child sized mop available. Yes, a toddler can mop. You could also set up a tray with a cup, pitcher of water and a small sponge to wipe spills. While taking the picture to show you, Solu insisted on pouring the water from the pitcher into the cup. he spilled about half of it but I was actually shocked by the control he had of the pitcher. Once i held the cup, he was able to pour some water into the cup and went on to drink it. This is the set up we use with his meal so he has watched me pour water from the pitcher into his cup a lot of time. The absorbent mind again. In addition to water, you could also make snacks accessible. Cheerios in a small bag or bowl. A banana to peel and eat etc. 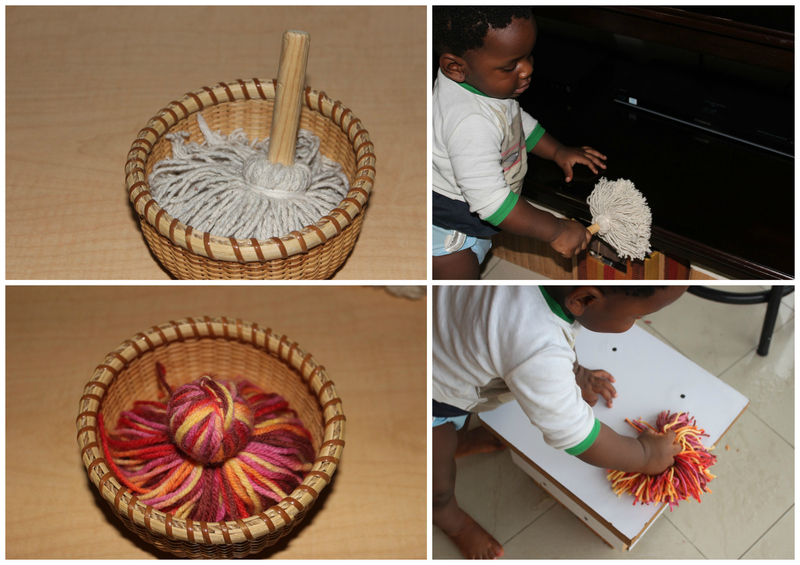 Dusting: Like mopping, dusting is also an easy activity for a toddler. He can dust furniture, his toys, plants or anything that needs dusting. They get a lot of pride from having contributed to the upkeep of the environment. You can see even my little guy already enjoys dusting. Tutorial for colored duster coming up soon. Can you tell he’s smiling while wiping the stool? Books! Read to the child and keep books available for him to look at. 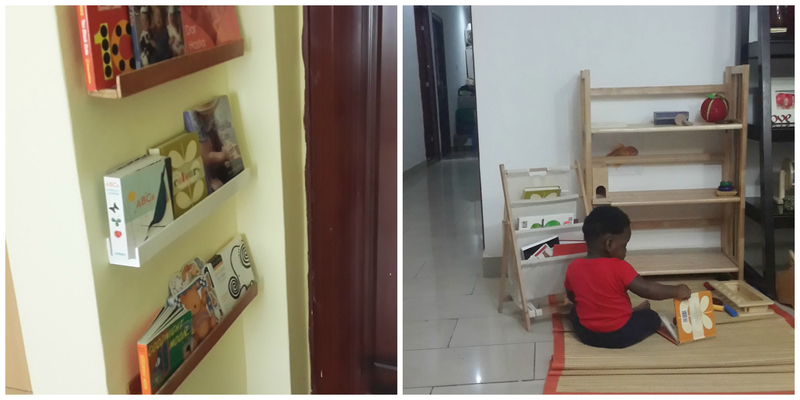 Make books available in every room where the child spends time. Words and Signs: This can be a tough stage because the child understands a lot of words, much more than he can produce. You can support him by continuing to give vocabulary. Name items in every environment you spend time in. Fan, sedan, thermometer, vegetable. Don’t be afraid to use big vocabulary and be specific. Remember the absorbent mind. In this case you and other adults around the child are the material. You provide the words. Signs are very helpful because the child can make them before he can speak. At nine months, Solu can sign milk, done, and water. Those are the main ones we have shown him. You can google ASL, BSL or baby signs to learn some signs. Remember to say the words too so don’t just make the sign, also provide the vocabulary so that the child makes the link. Matching/sorting: Children at this stage love sorting and matching. You could set this up on a tray. My examples use buttons and cutlery but they could also match fabrics of different textures, sounds, scents, stockings, pajama tops and bottoms. This requires some thinking. A CD player: accessible to the child. You could set it up with the CD and just show the child how to press play when they want or you could offer the choice of two or three CDs and show them how to put it in and play. Also show appropriate volume. Again, a very young child is able to do this. We are at the just press play stage. I have painted the play button and he listens to and dances to music several times a day independently. two or three musical instruments in a basket or on a shelf for the child to explore and make music with is another activity. Playdough: There are homemade recipes that you can find by googling or you could purchase commercial version. I loved plastacine as a child. A crayon and paper: You could put the crayon in a container so that the child needs to notify an adult when he wants to paint. Make sure the child has enough paper available so that he does not take to painting other surfaces. An underlay is helpful to protect the table. I would have one piece of crayon not one pack. I’ll write more about art in future. If you haven’t tried finger paint before this stage, I would try it before crayons. Be conscious about objects that can be choking hazards especially if your child is still mouthing. Most can be modified to make harder or easier depending on the child’s needs. Observe and make modifications as needed. You can have the same activities for a long time but vary the components. For example, colored sticks for the shaker activity or different kinds of beads to thread. I hope you get some ideas and find this post helpful. Please leave a comment with any questions or comments. Thanks for reading DK! Do let me know how how your child takes to the activities. great post… do you recommend a cup like Montessori does or can we use a bottle with a straw? Do we let the child dispense the water herself? if the point is to let them get water whenever they want, it seems counterproductive if we have to pour it for her…idk …thoughts? Thanks Mandex. You could definitely do a bottle with a straw if that’s what you’re comfortable with and then you could transition to dispenser when you feel your child is ready. I read somewhere recently that “independence is a series of conquests.” In this case the first conquest could be letting you know that she’s thirsty by bringing the bottle and the she could progress to opening or dispensing herself etc. Observer her and meet her at where she is. Let me know how it goes! This is wonderful! Thank you for sharing! I have been thinking about putting out some sorting activities, so thank you for the inspiration. Do you have any ideas of where I might be able to obtain some trays with little divisions like you have pictured – or did you make them? Hi! I’ve just discovered your blog and can’t stop reading it 🙂 I really like your tracker, it looks sturdy, can you, please, provide a link where I can buy it? Thanks. Hello Vanda! Thank you so much for reading. The tracker is by tag toys and is available on amazon. this is awesome nduoma , look for a way to get all these your write ups to parents n schools. Thanks Nduoma, always a nice and educative read. Sometimes I wonder can a child really do some of these things, but its amazing how much a child knows and can do if given the necessary encouragement and to think that some of these activities aren’t as far fetched as one imagines. I’m glad to see Sean doing some of these and will definitely encourage him to try others as well. Great Stuff!!! Thank you Bunmi. I’m also constantly amazed by what children are capable off. I would love to hear which ideas work with Sean. Hello Michelle, I don’t have one yet but will work on it. Thank you for your comment.